I had some fun making two sets of single-alphabet straight pins and a set of double-lettered alphabet straight pins...and I had my new pincushion to hold them all. 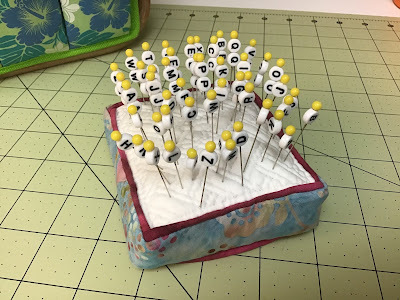 I needed those pins to mark lots of parts to make,"Legendary," from Elizabeth Hartman. My son who is in Air Force pilot training loves Bigfoot folklore. I want to add the quote, "All who wander are not lost," to the quilt but will tackle making the blocks first. 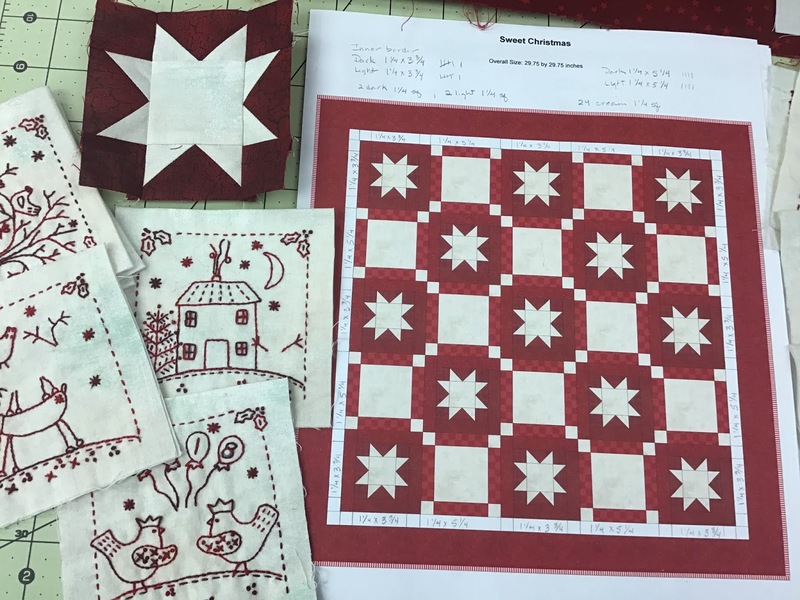 The second project I'm taking to quilt retreat is a mini quilt I designed on the computer program EQ8 incorporating my redwork blocks, "Sweet Christmas," from Australian quilt designer, Lynette Anderson. I made a sample of the star block to double check my measurements. Looking good. I also have two UFOs tucked in the stash to take. 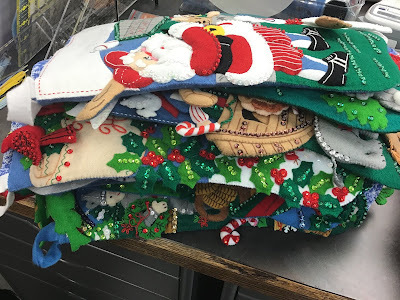 In the evenings, I am usually ready to stop working on my sewing machine so I am also taking several of my Bucilla stockings that only need some hand sewing to finish off linings. Tomorrow I will spend most of the day prepping my food. I am attending three nights and although there is a full kitchen and a small kitchen available, with 14 other quilters in attendance there is never enough room to prepare meals. I have been on a whole food plant based diet for almost a year now so no prepackaged foods for me. It's good food but takes dedicated time to prepare for four days. And then it will be time to pack my car! I’m anxious to see your Legend progress. I’ve got the pattern and fabrics to make that for a friend when he retires. Oh, color me jealous. 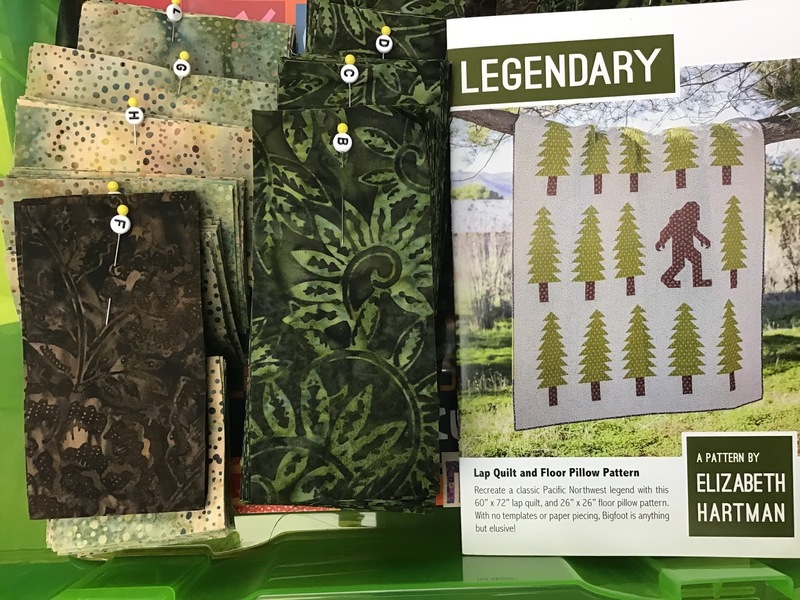 It's been so long since I went on a quilting retreat! Have a wonderful time and take lots of pictures. 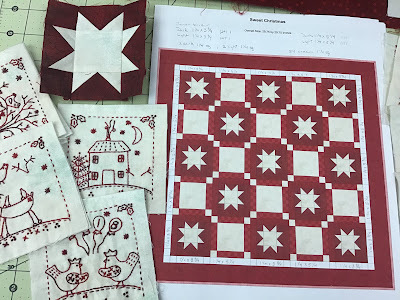 Love those little stitcheries, and they will look great mixed with the star blocks. I hope you’ve had a great retreat. I’m looking forward to seeing what you accomplish. Love your little ornaments!